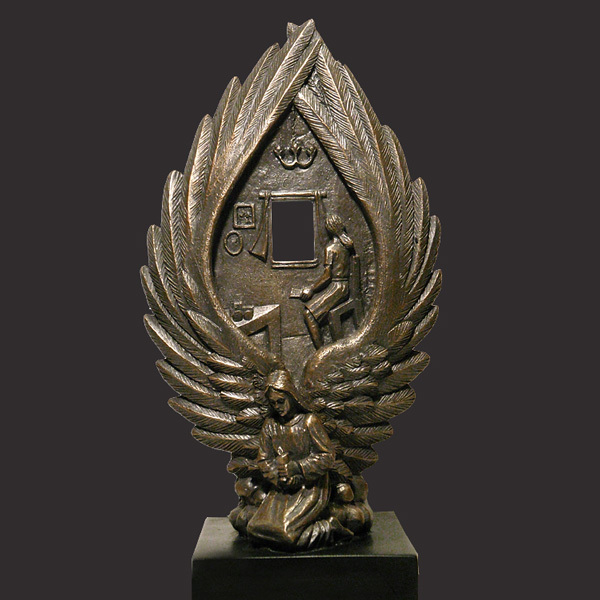 National Monument To Military Families by Timothy P. Schmalz is a beautiful Christian sculpture that honors the families of those men and women who serve in the military. 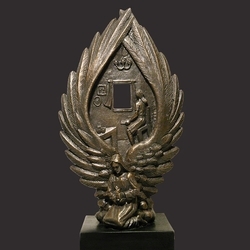 This sculpture that holds two scenes: the front shows a woman, a mother or a wife holding a letter looking out a window from her home. This scene is surrounded by the wings of an angel that holds a lit candle. This angel is symbolic of faith. The other side of the sculpture shares the same window. Beneath the window is a soldier in a combat zone holding a letter from home. The scene is surrounded by eagle wings the symbol of the military services, courage and bravery. This solid resin-stone cast is coated in a realistic bronze finish and is mounted on a solid matt black base. Timothy personally sculpts every original small masterpiece complete with his signature or monogram. Each replica is detailed by hand to the exacting standards of this modern day master sculptor.